painters and graphic artists are displayed. Divis for the tenth anniversary of Vysocany becoming a town. engineering industry (the factory Kolben and co.). railway embankment) in the renaissance style. by the bank of the northwestern shore. of water for Prosek, which is built on a sandy plateau low in water content. Prosek are said to be baptized with donkey’s water. narrow path to Prosek Pond, on Liben soil. the second world war a cinema was installed in the hall. side, adorned with the bust of Comenius. era moved to the now disused cemetery at the St. Wenceslas church. clubroom for many social and cultural associations based in Prosek. the 13th of January 1943.
changes to Holy Mass and Catholic rituals. garden with a baroque granary with a staircase and gallery. as killed, wounded or missing on each side. occasionally served as a cinema for Prosek. Gabcik and Jan Kubis, found shelter there on occasion. assassination, Smrz, Khodlova and the whole family were executed. and a total volume of 1600-1800m3 of water. of lime trees were planted alongside the mound of earth. studio „a05 ateliér zahradní a krajinářské architektury“. water, especially the goat willow. greatness of nature, before which we should bow with humility. child) and Balada o snu (Ballad of dreams). elements in which the poet dreams his childhood dream about changing the world. and Stanislav Hanzal, was placed in Park Přátelství (Friendship Park) in 1984. ‚Trojmezni‘, where three districts meet: Prosek, Liben and Strizkov. time that the stop was named. nation, for example Jungmann, Palacky, Safarik, and other national reformers. gold for teaching Sunday School. was destroyed during an air raid on Vysocany at the end of World War II. unusual outlook over the city is named after her. particularly weather-worn and friable, creating a very fine sand. generally 1-2m wide and up to 2m high. remnants of electric lighting probably are left from that time. after its last owner, Josef Machal: ’Machalka’’. continue the tradition of Prague’s wineries. Pinot Noir, Chardonnay and Blue Portugal. 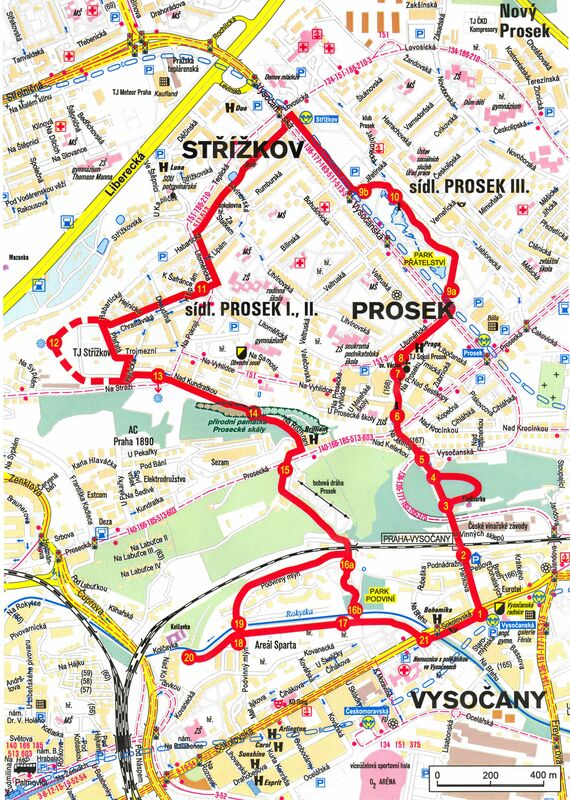 district of Prague 9 (right after the Park of Friendship in Prosek). of the landscaping project were Dr. S. Špoula and architect Miroslav Pacner. front made of semi-worked stones. playground which looks like a model of a Celtic fort. stepping stones over which you can walk. north of the Rokytka River. The most common tree in the park is the Norway maple. opposite direction through a wide valley. gatehouse and fencing – gave way to modern development. chlorine). The original factory – very modern and famous in all of Austria-Hungary – was built in 1832 in Sanytrová Street. ethanol, and the production of ethanol and potash only. the estate remained from the settlement. the Rokytka River, which flowed around it. the pleasure house to a manor and he also created a manor park in its garden. Thomas Brady sold Kolčavka to a chance buyer, who had it destroyed. and established his own private school at Kolčavka. – Těšnov. In 1984, the line was discontinued. the Vysocany and Liben factories. river is the sports complex TJ Praga Praha. 1909, originally as Sport Club Vysocany. of the land was used to create a small sand training pitch. also 5 railway bridges (viaducts) and many smaller bridges used by pedestrians. used to be a ferry. which is built into the wall of the newly reconstructed town hall.